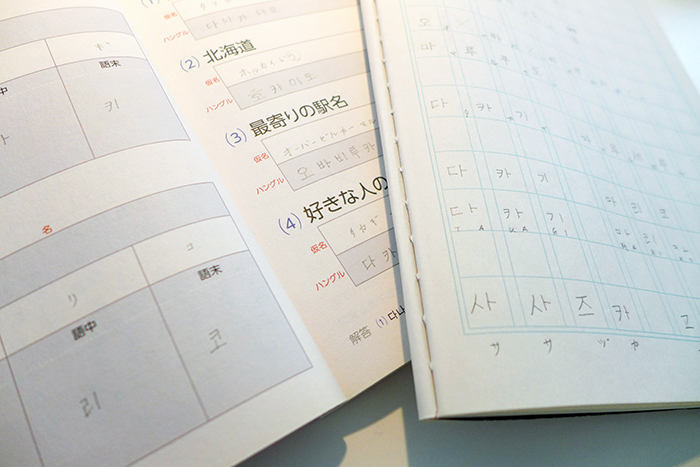 Starting by writing your name might be the very common way to let someone learn a new writing system. 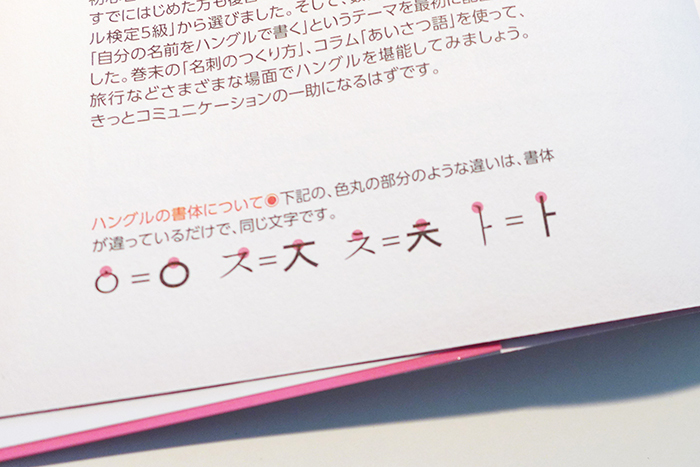 Using this Japanese instruction book, written by Hichol Cho, I was glad to have a fully Japanese name. First exercise was to write my name (Takagi Mariko) in katakana: タカギマリコ and using the list in the book I transformed it into Hangul. Great, I can use my knowledge about the Japanese syllabic system to learn Hangul and indeed the single elements of the Hangul characters remind me of Japanese Katakana. Second step. After using this syllabic idea, the author explains how to divide a Hangul character into consonants and vowels. Hangul seems to bridge or rather unite the idea of alphabetic and syllabic writing systems. The typeface used for this exercise book is a sans serif and at some parts it was hard for me to guess whether I should write each stroke separately or I should just change the direction of my pencil. – How close should I write the single elements within one character? – Do I need to follow an order to set the strokes? – The bowl shaped elements are not easy to balance in shape. Especially the flat ones. How can I do it better? The first chapter was probably not designed for one hour as it took me 25 minutes. I think this was a good choice, as I would like to do more. 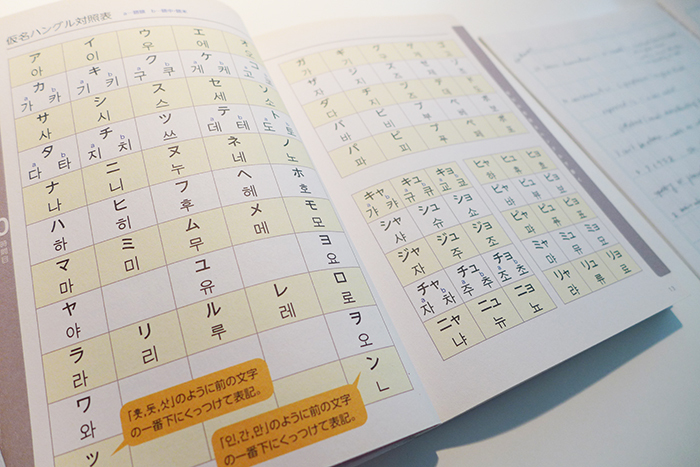 This table helps me to find the Hangul characters by the Japanese order of syllables. Interesting for typographers: how details change according to the selection of styles between “serif” and “sans serif” typeface. To get a general idea of the subject, I decided to read two chapters written by the linguist Florian Coulmas for today. This is a summary that focus on the history of the Korean script. Two major incidents of the 15th Century influenced the path of writing in Korea. One was the introduction of movable type in the early 15th Century to Korea. Another great invention was made in Korean, the Hangul letters. King Sejong issued in 1446 the royal rescript The correct sounds for instructing people 訓民正音, in which he published the simple phonetic notation system Hangul that he developed together with scholars. This system that was tailor made for the Korean language is the result of a linguistic research and a systematic graphical approach. King Sejong designed this logical writing system to fight illiteracy. However until the 20th Century Hangul was not reputable among the scholarly elite who preferred to use Chinese characters. The turning point for Hangul was 1945, when Korea became independent and Hangul the national script of Korea. Coulombs, Florian: The Blackweöö Encyclopaedia of Writing Systems. Blackwell, Oxford 1996, 273–277. Coulombs, Florian: The writing systems of the world. Blackwell, Oxford 1997, 118–122.